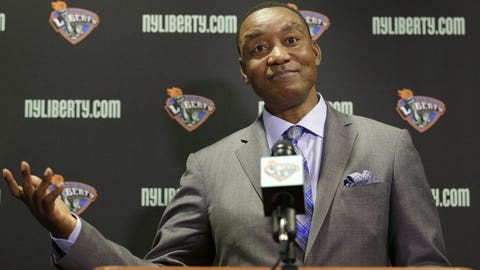 Isiah Thomas continues to deny any wrongdoing in the 2006 sexual harassment lawsuit. Knicks owner James Dolan almost never speaks with the media, and he certainly doesn’t talk to reporters about the sexual harassment suit which spurred a payout of more than $11 million back when Isiah Thomas was running his team. The silence breaks Tuesday evening as the controversy continues. HBO’s "Real Sports with Bryant Gumble" will run a segment on Dolan, Thomas and the 2006 suit filed by Anucha Browne Sanders, a former team executive. You can watch the full trailer for the episode below, which features some stunning quotes from Thomas and Dolan. In response to being read part of the official complaint, Thomas answers, "Never happened." And when pressed on why he didn’t settle for a lesser amount sooner, Dolan tells HBO Sports that "the fighter in me came out." Dolan also said in the trailer that he believes Browne Sanders made up much of she said in the suit: "I think a bunch of it she did, yes." HBO supplied an advance copy of the Isiah Thomas/ James Dolan piece, which appears tomorrow on "Real Sports" w/ Bryant Gumbel. Isiah Thomas on the case:"I felt like there was a drive by and somebody took a razor and just sliced me, and I just couldn't stop bleeding." In 2007, Browne Sanders won a settlement against Thomas and Madison Square Garden. The jurors in the case were unable to come to a verdict on whether Thomas personally owed Browne Sanders compensatory damages, and the judge was forced to declare a mistrial on that aspect of the case. Because the settlement was paid out by MSG, Thomas has used the mistrial to proclaim his innocence.